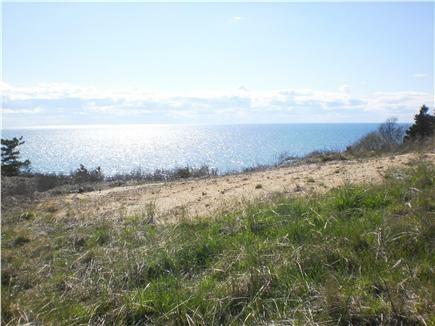 This is the perfect Cape Cod summer beach house, set slightly back from the beach on a slight rise, just two minute's easy walk down the path straight to the beach and miles of wide gorgeous sand in each direction. No long staircases to the beach, just a winding path and two short sets of stairs. 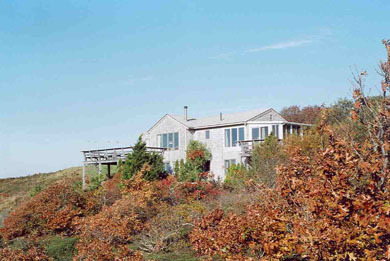 The house offers breathtaking 270-degree views that circle from Cape Cod Bay in front, with evening sunsets, and where you can see all the way across to Plymouth on a clear day, around to far distant views of the southern bay, and then to distant woodlands in the east. There are 4 Bedrooms, 2 full baths (both with tub-shower units). Top level main floor has a convenient open plan living-dining-kitchen, a large deck, full bath, large 12x18 master bedroom (queen), with a sunroom off of that (with sofa pullout bed, serves as a bonus, 5th bedroom, especially for babies & kids), plus an outside balcony off of that. 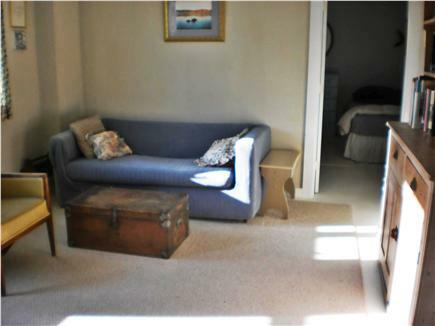 Lower level has 3 more bedrooms (1 queen, 2 doubles), TV den (with sofa pullout), full bath, laundry. 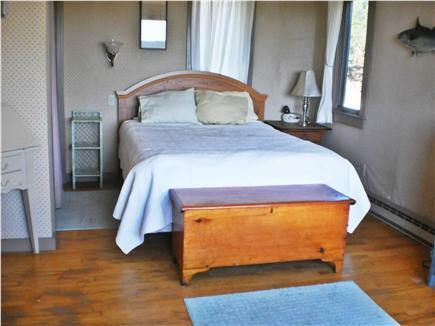 House also offers AC, a hot water outdoor shower, high-speed wireless, 3 flatscreen TVs/DVDs. 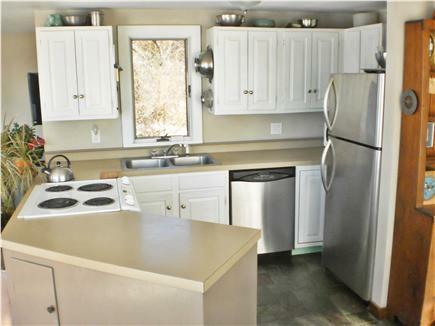 Plus a well-supplied kitchen with every utensil & small appliance you could need. Easy propane gas grill on the deck right off the kitchen/living area. Ground-level easy entry to both levels. The house layout conveniently handles many people well, whether you're gathering all together or dispersing for some relaxing solitude. 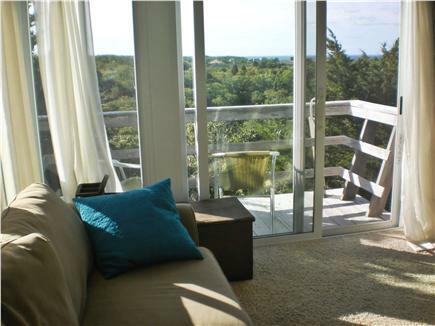 The wide-open siting on a dune overlooking the Bay affords cooling southwest sea breezes on the afternoons that you need them, so although AC is not always a necessity here, there are AC units both upstairs and down for those that may want it. There is plenty of level parking for 4+ cars, with very easy close access to the house from your car. 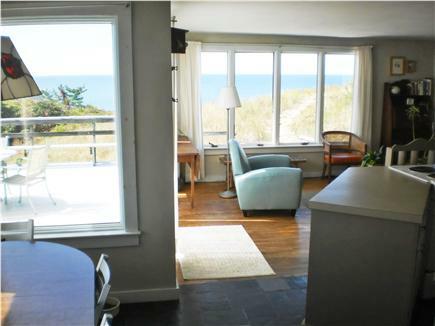 Located in the Ryder Beach vicinity, in a pleasant sparsely-built small beachside neighborhood. 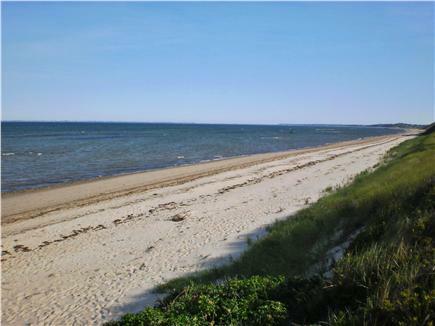 The beach is wide with clean white sand, extending as far as you can see in both directions - and is plenty wide even at the highest tides; then at the lowest tides there are sand bars to explore and dig clams, yet the water is always great for swimming at any time. Truly the perfect beach and safe waters for families at all ages, for swimming, floating, kayaking. There is near by access to hiking and biking trails and routes. And there is ocean-side surf swimming for a change of pace, a short few miles drive away. Truro is a unique rural seaside town, only about 4 miles wide between Cape Cod Bay and the Atlantic Ocean. There are also many fun local and seasonal shops and eateries, a golf course, a boat harbor, a winery, a lighthouse, a concert & music venue (Payomet), surf-casting from Bay and Ocean beaches for the avid fisherman, and much much more to explore. When you want a change of pace from your lazy and perfect beach living, a 10 minute drive south is the gallery, shopping and famous oyster town of Wellfleet; and 15 minutes north is the bustling tourist town of Provincetown, the outer tip of the Cape, packed with local shops, food, whale-watches, fishing excursions, pirate museum, rousing night life, historical spots, dune tours, Cape Cod National Seashore ocean beaches and dunes, even a small airport and a fast-ferry to Boston. Truly, the Outer Cape has everything. And of course you will find the best seafood in the world to eat, everywhere you go. Your pets are welcome to join the fun with advance permission. Thank You! We have had a truly wonderful stay at your gorgeous house. We are sad to leave. Many thanks Meredith -- What a truly magical place. I am sure we will be back. We spent many wonderful summer weeks at Meredith's house in Truro. You can watch the sunset from the deck, walk less than 100 feet to the water and play tennis right there on a court between the sand dunes. 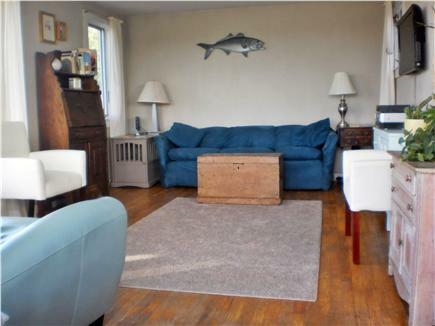 The house is ideally located with not only because it sits on the bay, but It is easy to get to Wellfleet and Provincetown. We decided to no longer go to the Cape, and while looking forward to what is next, will greatly miss spending another summer week at Meredith's. 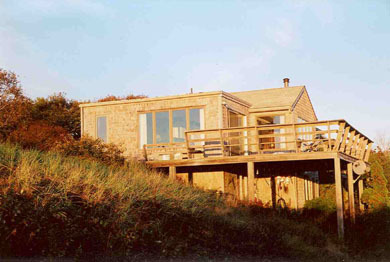 My husband and I got married on the beach and had a lovely intimate gathering here last summer. We stayed two weeks with our children, and had a really great time. The house is warm and full of the homeowner's family nostalgia, which I loved! 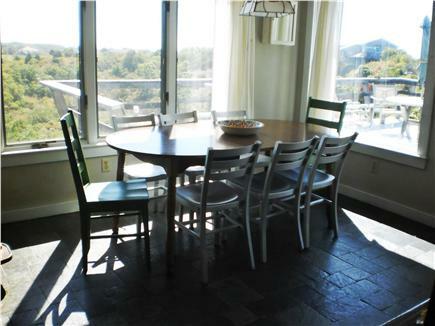 Close to the private beach, a great place to spend with your family. We live in Washington state, and loved every minute of our Cape Cod vacation. 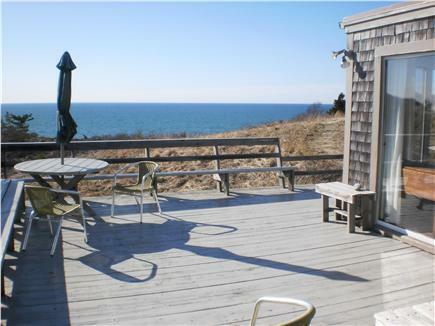 Meredith has owned this home since 1979, has enjoyed seeing two generations of kids grow up on this beach, and has provided the Perfect Cape Cod Summer experience to renters for over 25 years.